Every data center utilizes a UPS – Uninterruptible Power Supply – to ensure that power is always available, even in there is a power interruption. Minimizing downtime while maximizing energy efficiency is a primary goal of any data center or enterprise which is why choosing the right UPS is so important. The UPS begins supplying power immediately upon sensing that the primary power source has stopped functioning. This is important because it maximizes uptime which helps prevent frustration and financial loss, as well as prevents the loss of data. The UPS stores power and sits in waiting until it is needed but it requires things like maintenance and testing to ensure it is ready to be used when needed. There are two primary types of UPS: Flywheel and Battery and there are pros and cons to each that a data center must carefully weigh. A flywheel UPS (or sometimes referred to as a “rotary” UPS) is an older type of UPS but is still a viable option for modern data centers. Flywheel UPS and battery UPS provide the same essential function, but the way that function is achieved, the way energy is stored, is different. Flywheel batteries store kinetic energy that remains waiting for when it is needed. Flywheel systems pack a large energy density in a small package. Flywheel UPS systems tend to be significantly smaller than battery UPS systems. This can be an advantage when data center square footage is a premium. Further, Flywheel UPS systems are easier to store – they do not need as much ventilation, require less maintenance, and do not need special disposal arrangements to be made when their lifespan is complete. Flywheel UPS systems can literally last decades with a minimal amount of maintenance which is a stark contrast to battery UPS systems. One of the most significant drawbacks of a flywheel UPS system is its power output capacity when compared with battery UPS systems. TechTarget explains this key difference, “The UPS reserve energy source must support the UPS output load, while UPS input power is unavailable or substandard. This situation normally occurs after the electrical utility has failed and before the standby power system is online. As you determine whether flywheels are appropriate for a project, the amount of time that the reserve energy must supply the UPS output is key. For comparable installed cost, a flywheel will provide about 15 seconds of reserve energy at full UPS output load, while a storage battery will provide at least 10 minutes. Given 15 seconds of flywheel reserve energy, the UPS capacity must be limited to what one standby generator can supply.” Though flywheels cannot deliver the same length of power output that battery UPS systems can, multiple parallel flywheels can be installed so that they all supply backup power in the event that they are needed. Something important to consider is the type of data center. If your data center is part of a larger network of data centers then if power failure occurs, another data center could take over the data load and support your data center for a short time until you are back online. Many data centers are employing this network structure as a better means of maximizing uptime and efficiency. If this is the case, something like a flywheel UPS system may be ideal because you do not need a prolonged power supply in the event of an emergency. A shorter UPS runtime is all that is needed. But, make no mistake; many data center managers still want the maximum amount of time possible when it comes to UPS capacity. Further, some data centers are opting for a hybrid UPS system that employs both battery and flywheel. While the initial investment in a hybrid UPS system may be more, it should pay for itself in a matter of a few years. Another important consideration is energy efficiency since many data centers are trying to become more “green.” Though flywheel UPS systems are often thought of as the green option, Schneider Electric points out that this common assumption may be incorrect, “The results may come as a surprise to many. In almost all cases, VRLA batteries had a lower overall carbon footprint, primarily because the energy consumed to operate the flywheel over its lifetime is greater than that of the equivalent VRLA battery solution, and the carbon emissions from this energy outweighs any carbon emissions savings in raw materials or cooling. Of course, the tool lets users conduct their own comparison to see for themselves. This analysis and tool are a good reminder that decisions around energy storage needs to factor in a number of variables.” It is more apparent than ever before that ever data center must evaluate their unique, individual needs, as well as their energy goals and uptime goals when choosing which type of UPS system is best. 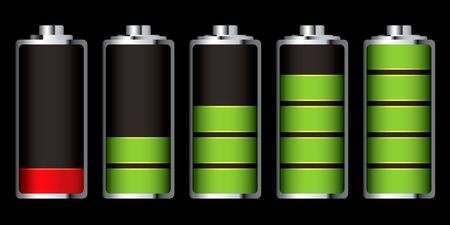 A battery UPS system supplies electrical power through a chemical reaction that happens within the battery, unlike a flywheel system that uses kinetic energy. Battery UPS systems are often favored by data centers because they can provide a much longer supply of power than a flywheel UPS. The exact length of time available will depend heavily on the battery’s age, how well it has been maintained, etc. but for reference, a battery UPS may be able to provide 5+ minutes of power (and sometimes much more depending on a variety of factors as mentioned above) vs. a flywheel UPS that may only be able to provide less than a minute of backup power. Though a battery UPS provides longer power supply when it is needed, it is not without its drawbacks. UPS batteries must be routinely maintained. This includes visual inspection, ensuring adequate cooling and ventilation, cleaning and more to ensure that they will work properly in the event that they are needed. Additionally, UPS batteries have a shorter lifespan than flywheel UPS systems. This is because the chemicals within the batteries diminish over time and ultimately lead to battery failure. For this reason, UPS batteries must be not just routinely maintained but frequently checked to ensure that they are still working and capable of supplying power. Further, a UPS battery has a limited number of discharge cycles. Though it can recharge, if it is frequently discharged and then recharged, it will diminish its “expected” capacity and lifespan over time. For flywheel UPS systems, this is not a problem (though it should be noted that flywheels can only discharge a limited number of times in a short time frame, but multiple discharges over a long period of time is not problematic). Additionally, UPS batteries contain hazardous materials that must be safely and correctly disposed of when no longer needed. This means that UPS batteries require special disposal methods that flywheel UPS systems do not require. In the technology world, processes and products that are the “old” way of doing things tend to go away quickly in favor of the latest and greatest advancements. But, when it comes to flywheel UPS systems, they are getting a new life, particularly in the form of hybrid UPS systems. 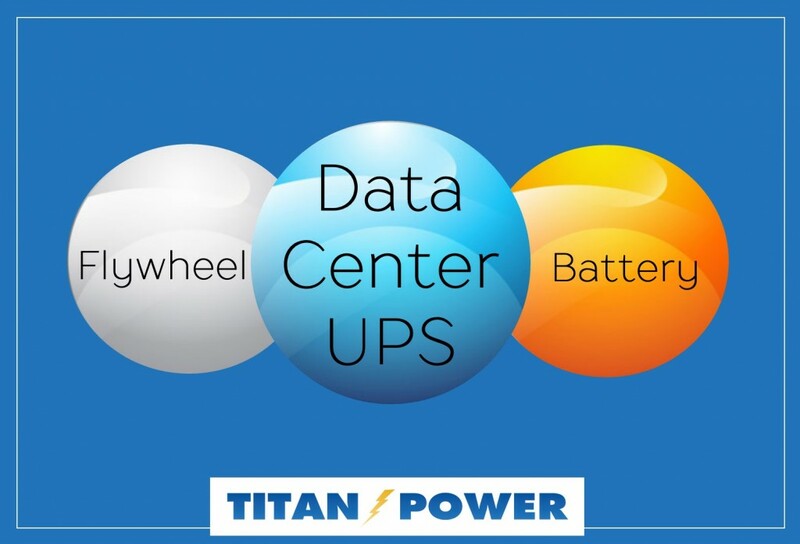 Flywheels are not an alternative to UPS batteries when it comes to energy efficiency or length of power supply – but that does not mean they are not a viable option for many data centers. Depending on unique data center needs, they should be considered both from a standalone perspective or as part of a hybrid UPS system to ensure better backup power supply that maximizes uptime and efficiency. This entry was posted in Back-up Power Industry, computer room maintenance, Data Center Battery, data center equipment, Data Center Infrastructure Management, data center maintenance, DCIM, Facility Maintenance, Power Management, Uninterruptible Power Supply, UPS Maintenance and tagged computer room maintenance, Data Center, Emergency Power Systems, Uninterruptible Power Supply, Uninterruptible Power Systems, UPS, UPS Batteries, UPS maintenance, UPS Systems. Bookmark the permalink.